Great sounding A-5 model Flatiron mandolin. Exc (-) condition. SN# 88100972. Width at nut: 1 1/8″. Radiused fingerboard. Label signed by Dennis Balian. Recent professional fret job. Very nice spruce top. Highly figured Maple back, sides, and neck with gorgeous vivid amber sunburst throughout. Even the back of the peghead shows very good figure. Snakehead peghead. Ebony peghead overlay has The Flatiron logo at top and Fleur de Lis inlaid in center. Radiused Ebony fingerboard has pearl dot inlays and double-cut fingerboard extension. Original Loar-style Ebony bridge in great shape. Original 2-pc tailpiece replaced with universal Weber nickel 1-pc cast tailpiece. Original tuners, bridge, and case. This A model mandolin sounds great. It is built well and voiced to have great tone. While it does have a few dings on the Spruce top, the back, sides, back of neck and the peghead and fingerboard are just great. It also has recent professional fret job, with nice new frets and perfectly milled Ebony fingerboard. This mandolin is from a great period of mandolins built in Bozeman, Montana at the Flatiron facility. 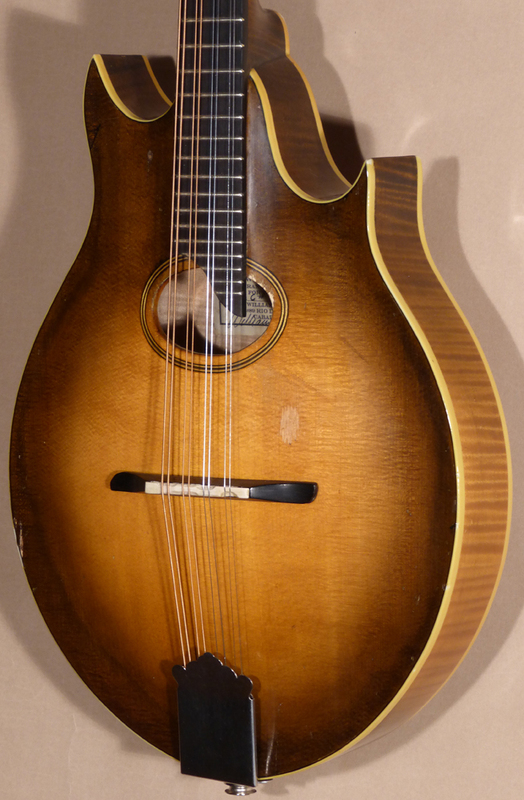 Flatiron mandolins made in Bozeman were very popular and consistently good sounding. Just a couple of years before this mandolin was made, Gibson merged with Flatiron in a 10-year buyout. This was negotiated so that Gibson mandolins would be built by Flatiron in Montana, because their consistency was so highly regarded. Bruce Weber was the head luthier. Dennis Balian was plant manager. Great sound, great look. Comes with original hard case.